Get ready to cry tears — this is your official warning. Also, if it’s any consolation, I’m sitting here crying right along with you. Again. Remember that time I counted down all the horsey things that made all equestrians cry every time? 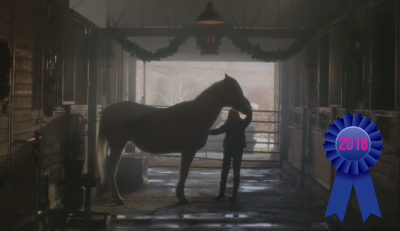 Those seven moments were a mere warm-up act to this video from Purina. Everything about this ad is perfectly written, shot and edited to be a giant sob-fest from beginning to end, whether you’re ugly-crying with sadness or joy. Grab your tissues, Horse Nation. You’re going to need them. What an emotional roller coaster. Sure, we suspected we knew the ending from the moment it began, but that doesn’t diminish the wringer we just put our hearts through. We hope that, once you’ve dried your tears, you might be inspired to help horses in need yourself: volunteer for your local horse rescue, make a monetary or equipment donation to a rescue in need or maybe even adopt a rescue horse into a permanent, safe home. Purina sponsors A Home For Every Horse, which is a program designed to help find safe, loving, forever homes for rescued horses. Through A Home For Every Horse, Purina has donated over $425,000 to participating shelters, which equates to over 800 tons of feed. Purina, we at Horse Nation thank you for your good work in helping rescued equines in need! Go A Home For Every Horse. Go hug your own horses. And go riding.